According to a new market report published by Transparency Market Research, “Global Driver Assistance System (DAS) Market for Locomotive - Global Industry Analysis, Size, Share, Growth, Trends, and Forecast, 2018–2026” expanding at a CAGR of 9% during the forecast period. In terms of revenue, the market is expected to reach US$ 18 Mn by 2026. 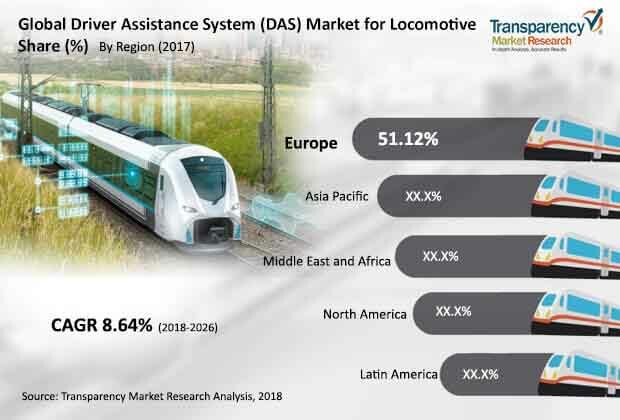 The global driver assistance system (DAS) market for locomotive is projected to expand at a CAGR of 9% between 2018 and 2026, according to a new research report by Transparency Market Research (TMR). According to the report, the global market is likely to be influenced by a range of political, economic, social, technical, and industry-specific factors. Latin America is expected to witness rapid rise in demand for driver assistance system in public transits such as trains, with the market in the region anticipated to expand at a CAGR of 27% during the forecast period. Human safety is of utmost importance for any industry. Trains are considered to be a risky mode of transportation. Control over a train cannot be achieved within possible time due to its speed and size. This is supported by the statistics on the fatalities caused by train accidents. In 2016, more than 50,000 people lost their lives due to rail accidents. In the 28 nations of the EU, 1,723 persons were killed in train accidents, which is 6% rise from the previous year (2015). India has serious issues associated with rail transportation. Every year, more than 15,000 people in India lose their lives owing to train-related fatalities. There needs to be a system which can monitor the train and improve driving conditions for the driver and traveling conditions for passengers. Driver assistance systems provide greater functionality and effectiveness for trains. Various regulations are imposed by regulatory bodies on the automotive industry and mandated several systems or applications for vehicles to curb the accident rate. Such regulations are likely to be imposed on trains. However, train component manufacturers need to include DAS in old running and new trains in order to comply with such regulations. This is likely to boost the driver assistance system (DAS) market for locomotive. Developing and under-developed countries in Latin America are more focused on implementation of long-distance trains in the region. Governments of countries such as Chile and Argentina are spending more on railways in their budgets. Expansion of the IT sector is providing a boost to the economy in the region. Usage of suburban, monorail, and metro as modes of public transit is increasing in order to commute within urban areas. Monorails are highly preferable in the city with less population and space. Trams are an older mode of public transport. Trams are not suitable for large cities or metropolitan areas. Therefore, the tram segment is likely to expand at a sluggish pace, as compared to other train type segments. Older trams are likely to be equipped with DAS. In terms of revenue, the long distance train segment is expected to reach US$ 3.6 Mn by the end of 2026, expanding at a CAGR of more than 20% during the forecast period. Based on DAS application, the driver assistance system (DAS) market for locomotive can be segregated into emergency braking, automatic door open & closure, switch detection, rail detection, fog pilot assistance system, rail signal detection, and anti-collision system. The DAS has various applications in trains such that one or more than one application is integrated within the train. Rail signal detection system is a recently evolved application and the segment held a minor share of the market in 2017. It is likely to expand at a higher growth rate during forecast period. In terms of DAS component, the LiDAR segment is expanding at significant pace due to its multi-functionality and declining price. Europe held a major share of the global driver assistance system (DAS) market for locomotive in 2017. Countries in Europe exhibit greater awareness about the environment. Therefore, people in the region are more inclined toward using public transport instead of personal vehicles. Increase in public transport is estimated to boost the usage of trains in the region. The human safety body of the European Union has mandated some norms for component manufacturers to include driver safety modules including some DAS applications for trains. This is likely to boost the market. Revised taxes, expansion of business during Brexit, and tariffs imposed by the U.S. on the nations in Europe are expected to hamper the production and sales of components/technology in Europe, which in turn is anticipated to hamper the driver assistance system (DAS) market for locomotive. Governments establish IT zones outside major cities, which increases the border of cities in countries such as India, Large population, large area, increased distance between cities, raising wages, increasing purchasing power, and increased in standard of living are key factors that drive the market in Asia Pacific. Advancements in processes used to manufacture driver assistance systems, development in the materials utilized to produce the components that are employed to manufacture DAS, and development in design of systems that are compact and highly effective are fueling the driver assistance system (DAS) market for locomotive. The global driver assistance system (DAS) market for locomotive is highly cohesive as design, analysis, and manufacturing of the driver assistance system requires advanced technology, highly equipped labs, high investment, considerably skilled workers, and high precision. Moreover, the market witnesses the presence of major manufacturers working in the transportation industry for several years. Major share of the driver assistance system (DAS) market for locomotive is held by major manufacturers. Major players operating in the driver assistance system (DAS) market for locomotive include Thales Group, Alstom S.A., Hitachi Ltd, Bombardier Transportation, Ansaldo STS, SIEMENS AG, Mitsubishi Electric, CRRC Corporation Limited, Kawasaki Heavy industries, Ltd., General Electric, ABB, Construcciones y Auxiliar de Ferrocarriles, S.A., CalAmp, Beijing Traffic Control Technology Co., Ltd, Bharat Forge limited, Wabtec Corporation, SBB, Robert Bosch GmbH, Knorr-Bremse AG, and Woodward, Inc.